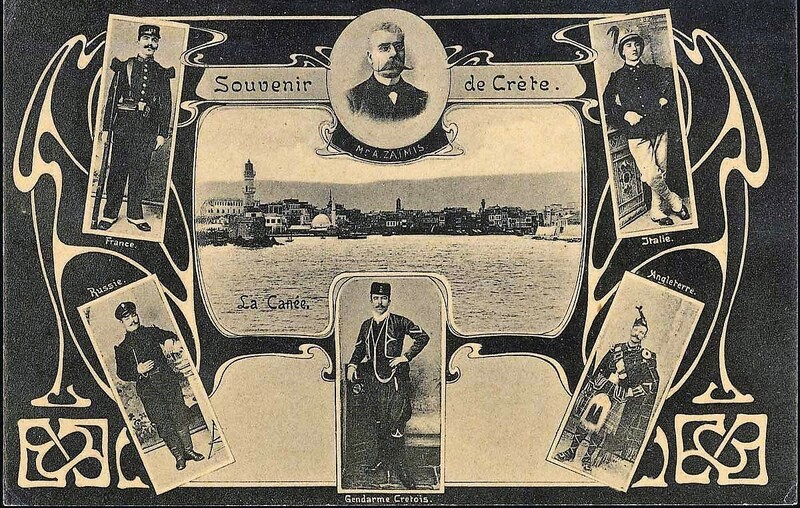 Cretan High Commissioner | The British in Crete, 1896 to 1913. Alexandros Zaimis High Commissioner of Crete. 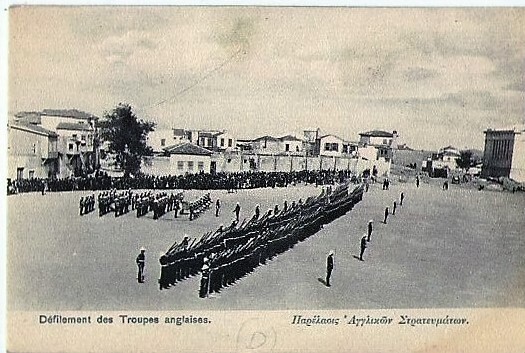 Zaimis arrived in Canea and was greeted with an appropriate military guard of honour, the British contingent apparently being provided by the Royal Navy, as shown on the contemporary postcard photograph below. The arrival of High Commissioner Zaimis. 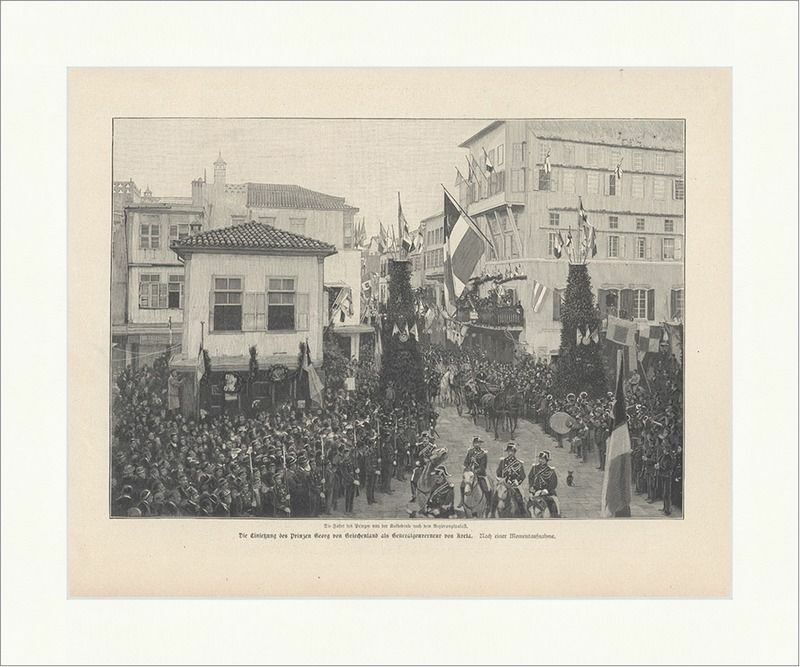 Canea 30 September 1906. 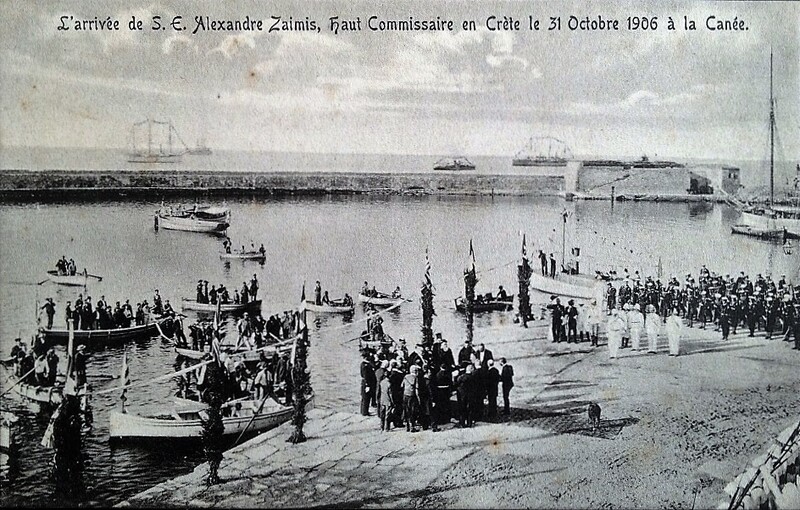 Interestingly, an almost identical photograph – note to positions of the rowing boats – was used on another postcard This time more detail of the event is added; however, the date given is one month out. High Commissioner Zaimis arriving Canea. Note the incorrect date. Zaimis’s career as High Commissioner was relatively brief. Although appointed for a term of office of 3 years, on 12th October 1908 he was in Athens, by coincidence or otherwise, when the Cretan Administration declared union with Greece. Following this Zaimis, though technically remaining High Commissioner, never returned to the island. 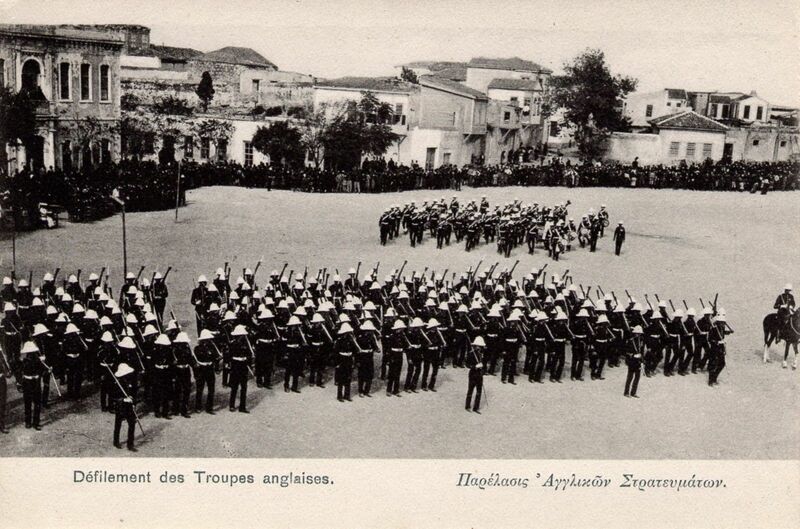 Parade of British Troops in honour of High Commissioner Zaimis. Iraklion parade for High Commissioner Zaimis. High Commissioner Zaimis passing British troops in review. The exact date of the parade is, as yet, undetermined. However, if it was between his arrival in September 1906 and February 1907 it was 2/Royal Sussex, between February 1907 and February 1908, 1/Royal Inniskilling Fusiliers, and after then until his departure, 3/King’s Royal Rifle Corps. A regiment which definitely WAS NOT involved was the unidentified Highland regiment shown in the card below; the last Scottish regiment to serve on Crete, 2/Cameron Highlanders, left the island in March 1903. 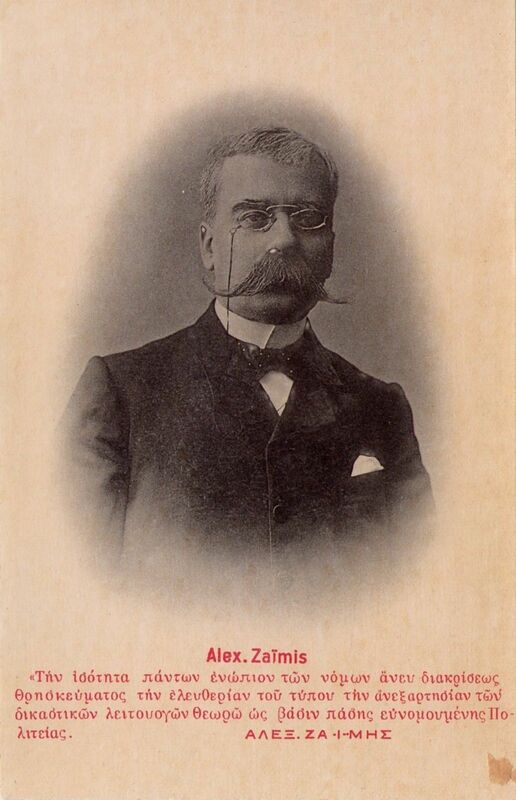 Souvenir postcard of High Commissioner Zaimis – date unknown. Holland, R. and Markides, D. The British and the Hellenes. Struggles for Mastery in the Eastern Mediterranean 1850 – 1960 (Oxford, 2006). 128. 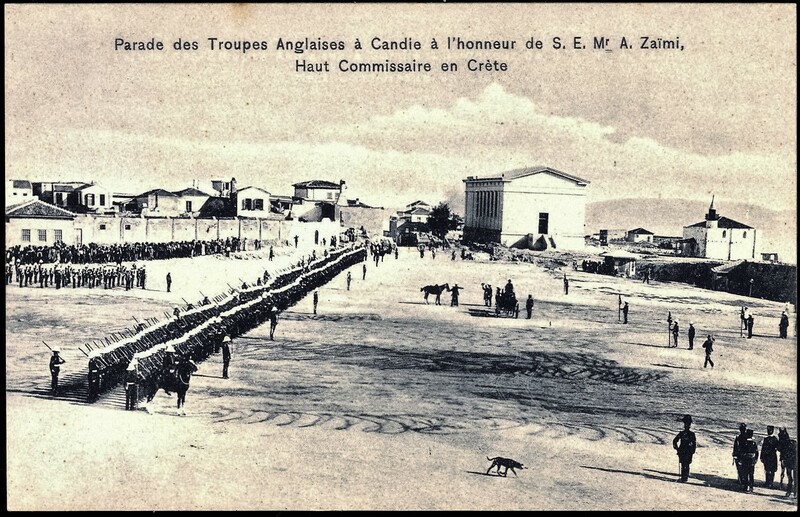 This entry was posted in British Army in Crete, Cameron Highlanders, European Intervention Crete, Inniskillings, Royal Sussex and tagged 2nd Royal Sussex, 3/King's Royal Rifles, Alexandros Zaimis, Cretan High Commissioner, Crete 1908, European Intervention Crete, Inniskillings on July 3, 2016 by Mick McT. Prince George – An uncertain reception? The arrival of Prince George in Suda Bay. German print. Note the British sailors, presumably armed with 40 rounds each. The entry of Prince George into Canea. December 1898. German print. *This followed the pattern of European involvement in creating or restoring Greek monarchs. The first modern King of Greece, Otto, was a Bavarian prince chosen by the Concert of Europe; when the Greeks threw him out in 1834, the Concert gave them Prince Christian William Ferdinand Adolphus George of the Danish Holstein-Sonderburg-Glucksburg line to reign as George I. As late as 1944, the British Government and army were involved in supporting the eventual reinstatement of King George II who, after enthusiastically supporting the extreme right-wing Metaxis dictatorship prior to the German invasion, had been in exile throughout the war. ** National Maritime Museum JOD 207. Dairy of Thomas Willis A. B. H.M.S. Dido. Spelling and punctuation as original. 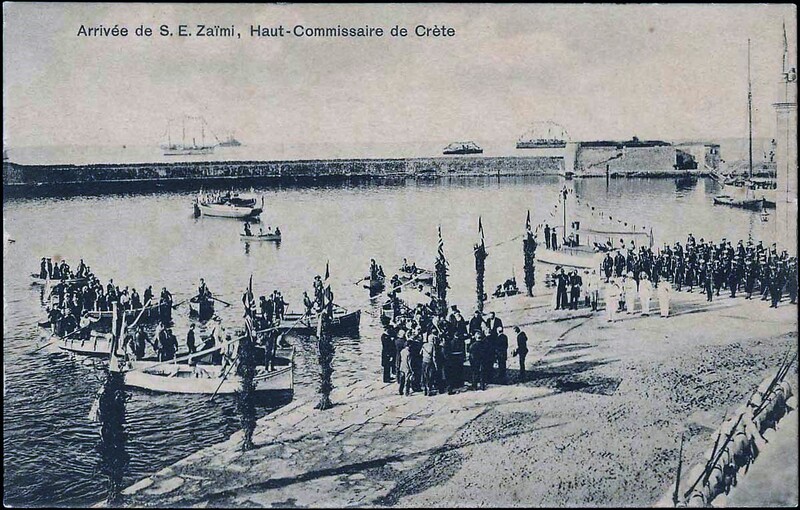 Willis appears to have got the landing place incorrect; George landed at Suda Bay, Canea on 21st December 1898; he didn’t go to Candia (Iraklion) until mid-January 1899. 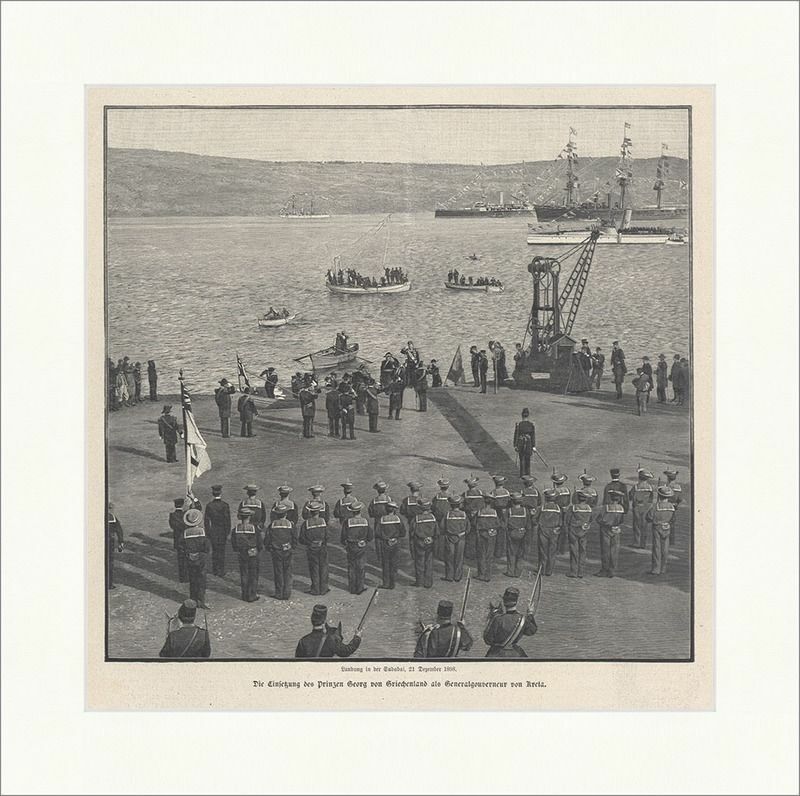 This entry was posted in European Intervention Crete, Royal Navy in Crete and tagged Cretan High Commissioner, Crete 1898, European Intervention Crete, Prince George of Crete on June 3, 2016 by Mick McT.